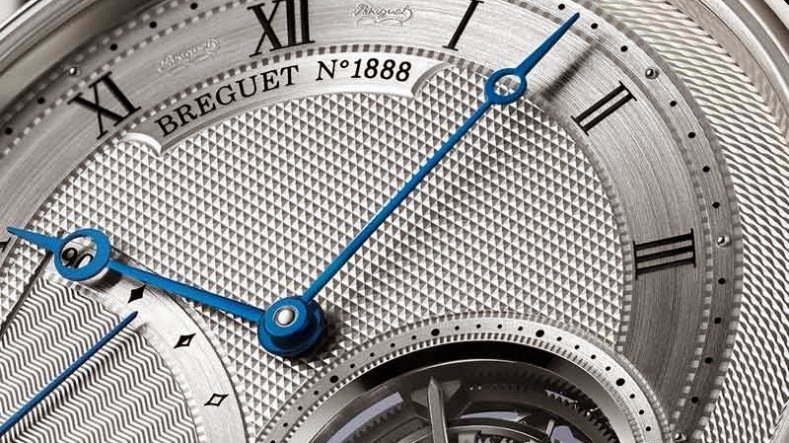 The Breguet Classique Tourbillon was introduced at Baselworld 2013 in a rose gold version. Now it is time for the platinum version (ref. 5377PT) to hold the stage. This ultra-thin timepiece is characterised by an off-centre tourbillon with a patented carriage in titanium. The 42 mm platinum case houses the calibre 581DR beating at a pretty high frequency, especially for a tourbillon, of 4 Hz or 28,800 vibrations per hour. The movement incorporates a balance spring in silicon - an anti-magnetic material with exceptional stability and resistance to any environmental interference, including magnetic fields - and an escapement made of silicon and anti-magnetic steel. Despite of the high running frequency, the Classique Tourbillon ref. 5377 offers a remarkable power reserve of 90 hours thanks to the patented “high-energy” barrel on roller bearings. 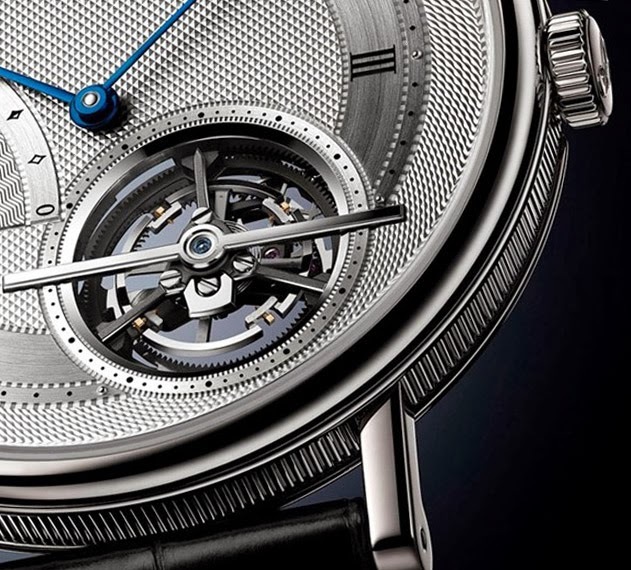 To keep the height of the movement down to 3mm in a 7mm thick case, so creating one of the thinnest automatic Tourbillon watch in the world, Breguet’s watchmakers had to place the bi-directional platinum winding rotor on the periphery of the movement. The dial is finely decorated with four different patterns: 1) a hobnail pattern for the hours and minutes chapter with Roman numerals; 2) a barleycorn surround; 3) a straight chevron pattern for the power-reserve indicator at 8:30; 4) cross-hatching to outline each feature. A blue sapphire enriches the centre of the Tourbillon bridge completing a timepiece that mixes tradition and innovation. 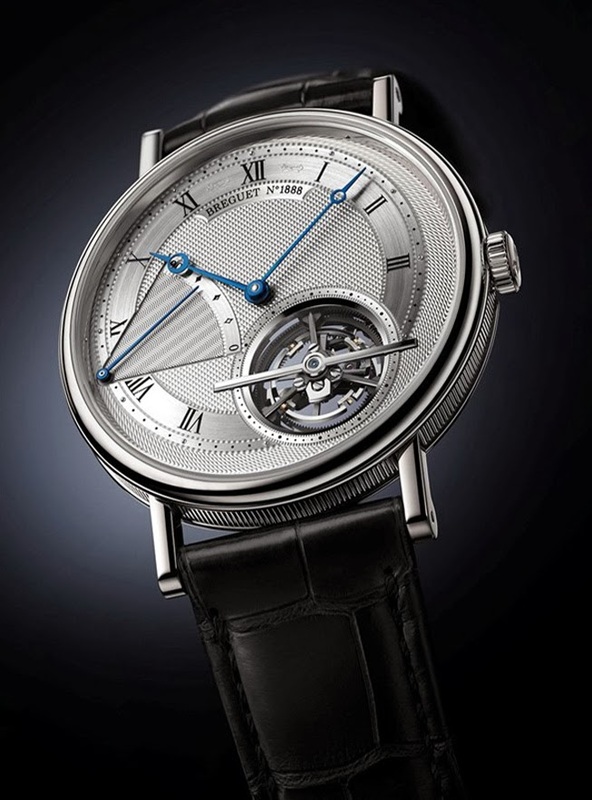 The Breguet Classique Tourbillon Ref. 5377 was introduced at Baselworld 2013 in a rose gold version. Now it is the moment of the platinum version. This ultra-thin timepiece is characterised by an off-centre tourbillon with a patented carriage in titanium.